As they balanced their tripod to capture a photo of themselves in front of Lake Minnewanka four years ago, Minnesota couple Melissa and Jackson Brandts had no idea that their innocent photo opportunity in Banff National Park would turn into a world-wide internet sensation. In the few seconds between starting the camera’s timer and photo being snapped, an eager ground squirrel (now aptly known as the Crasher Squirrel) popped up in front of them to investigate the situation. The lens refocused on the Crasher Squirrel, and the furry creature took one step closer to stardom, thanks to its impeccable timing and inexplicably humanistic reaction of awe. 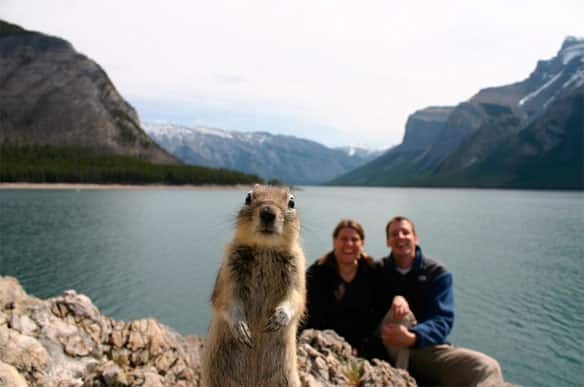 The couple posted the photo online and sent it to National Geographic and within days, the Crasher Squirrel appeared all over the web in hilarious Photoshopped pictures with politicians, celebrities and in unusual settings. The photo was even discussed The Today Show and inspired its own app—the Squirrelizer. We don’t know where the Crasher Squirrel is now, but we do know that it has left its paw prints on our hearts. With the Crasher Squirrel’s four-year anniversary approaching, we wanted to celebrate Canada’s famous rodent with the best examples of the meme. Here they are—let us know your favourite! One small leap for man, one giant leap for squirrel kind.